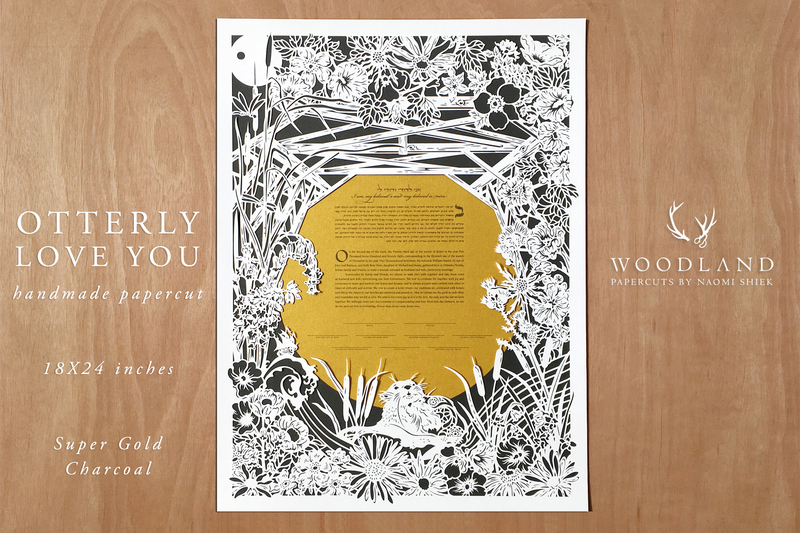 Courtney & Saul's ketubah order was very straight-forward. 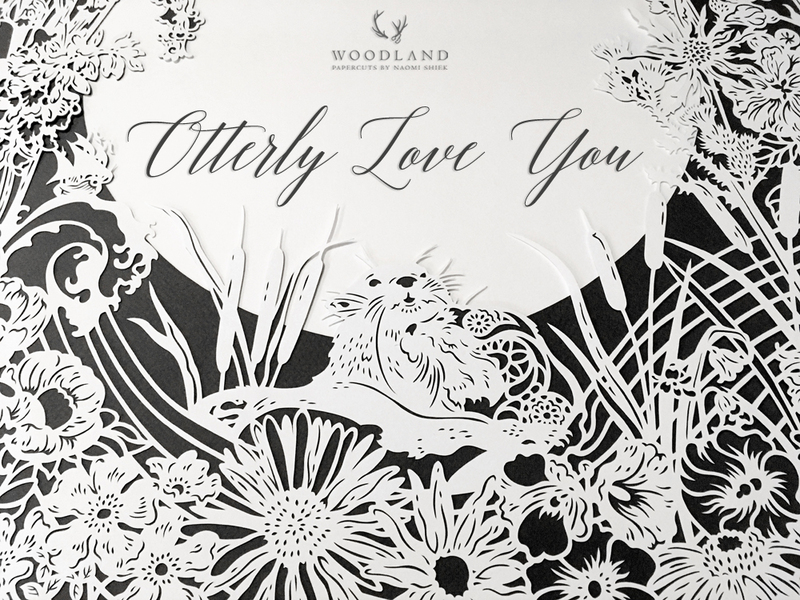 They opted for the easy, no-fuss route of choosing one of the bespoke designs from my shop - the ORCHIDS. A quick consult with me on the color options (mockups included! ), and the couple chose the Orchids in timeless ivory and silver. 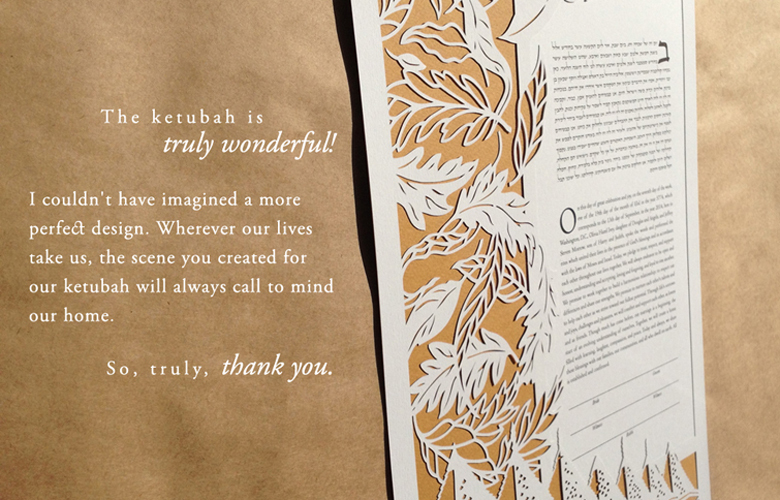 They also provided their own Egalitarian text for the ketubah, which I personalized with their details and font choice. 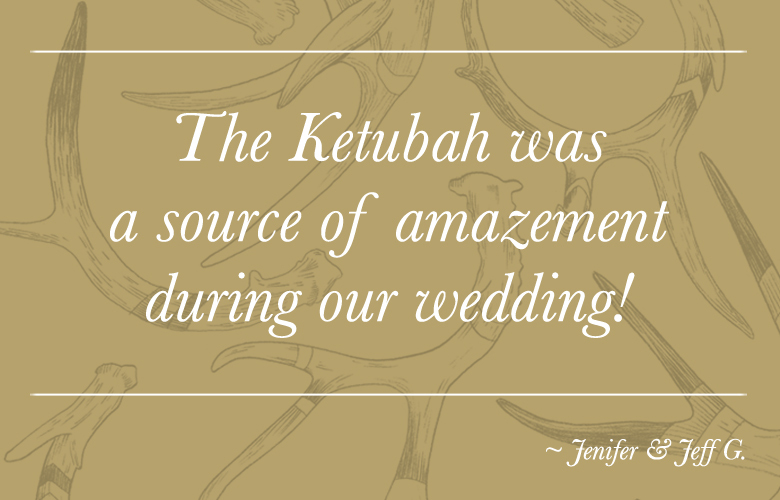 A quick proofreading by them and off their ketubah went. Four days later they had it in their hands! 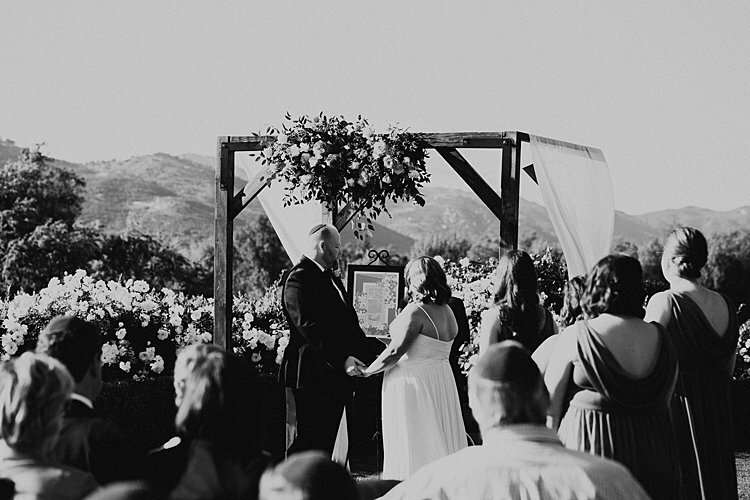 Courtney & Saul's elegant wedding was featured on the wedding blog Smashing the Glass. 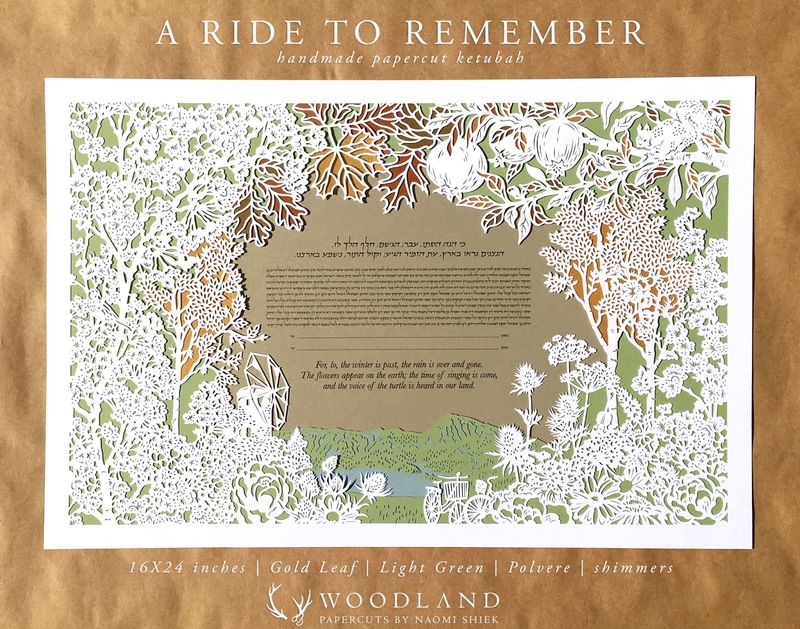 They read their ketubah aloud to their guests, so this cherished handmade artwork will undoubtedly always evoke those heartfelt memories for them. 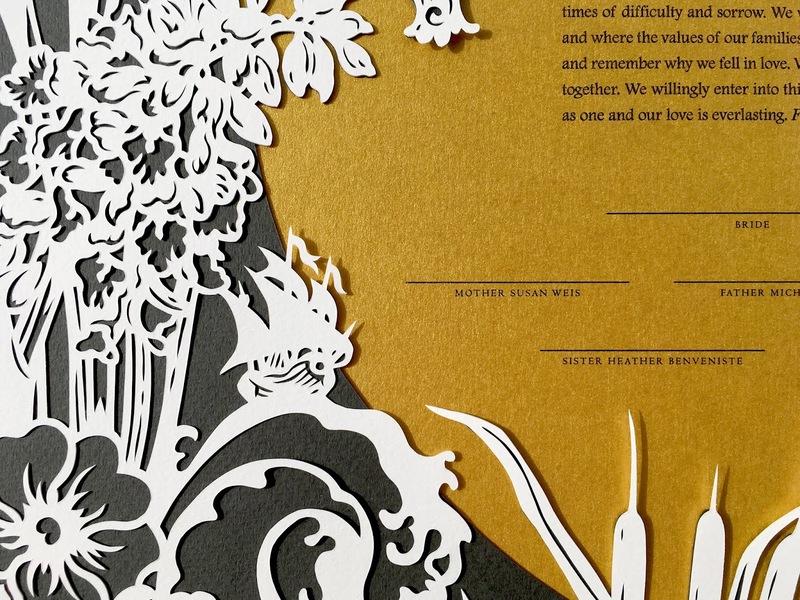 Even though my work is very crafty and old school - there's no machine cutting these papercuts for me! - I do rely heavily on technology for my business. All my clients are from overseas after all! But man oh man, the magic of the internet escapes me sometimes. For some reason every year or so I suffer through a mysterious bout of disappearing emails and bad connection. It always takes me a few weeks to realize the dearth in customers isn't a natural occurrence and then I scramble to make heads or tails of what's happening. It happened to me again over the holiday season and the start of this year, but this time I solved it with some coding mumbo-jumbo and managed to recover at least 2 weeks of emails (older ones were gone for good, sadly). This commission here fell victim to that internet void, but luckily Zan believed in me enough and persisted through network glitches and missing emails to share with me her vision for the ideal wedding keepsake and cherished artwork. S I D E N O T E | It came out so well. So please don't give up on me if I fail to reply, I lost your email and can be reached over on instagram and etsy! 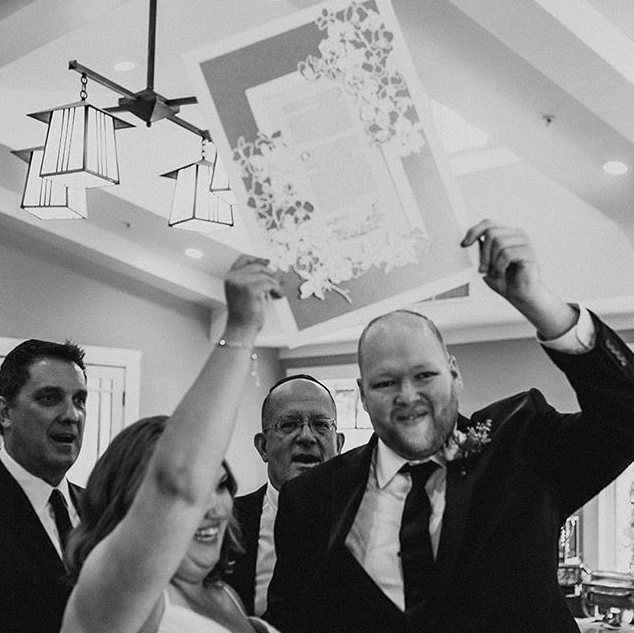 Every time anew I am humbled by the trust and respect clients put in me to commission a wedding art piece that will not only stand in a place of honor in their homes, but in their hearts as well. There's a special kind of power in that artwork, which I feel comes from the shared affinity I and my clients have for Mother Nature. Its regenerative powers of healing and hope go hand in hand with that of Love, and what I strove to convey with this design of an idyllic view. The flowers appear on the earth; the time of singing is come, and the voice of the turtle is heard in our land;"
After I finished drawing the papercut I decided adding colors to the leaves would really make them jump off the paper, as it were - so I spent a few hours assembling these like a puzzle underneath and over each other. It was strangely therapeutic, and the impact of the different golden shades shimmering in the sun cannot be disputed! I always liked lush designs with a lot of detail. 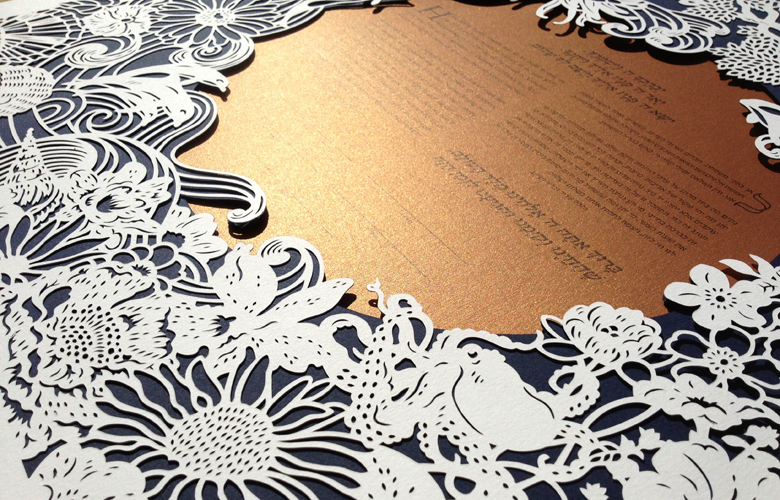 A good example for an amazingly full and lacey design is this one, commissioned by Lev for his wife Jamie. 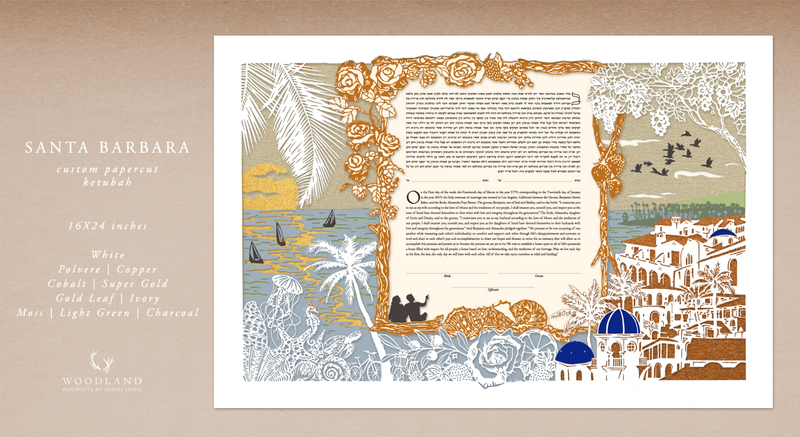 Lev asked for an anniversary ketubah to celebrate their relationship milestone. 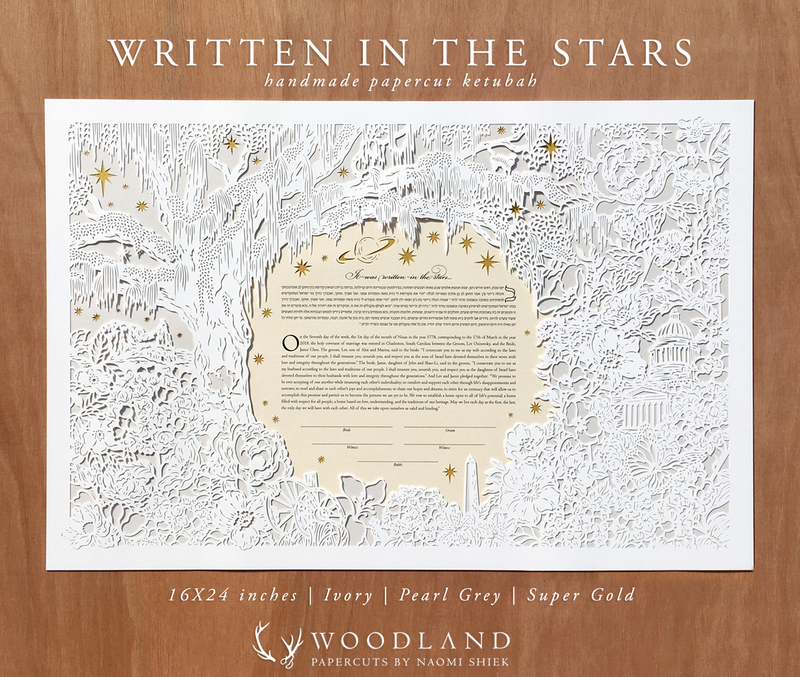 Our starting point was his proposal, which was written in the stars across the planetarium's IMAX dome (be still, my heart!) 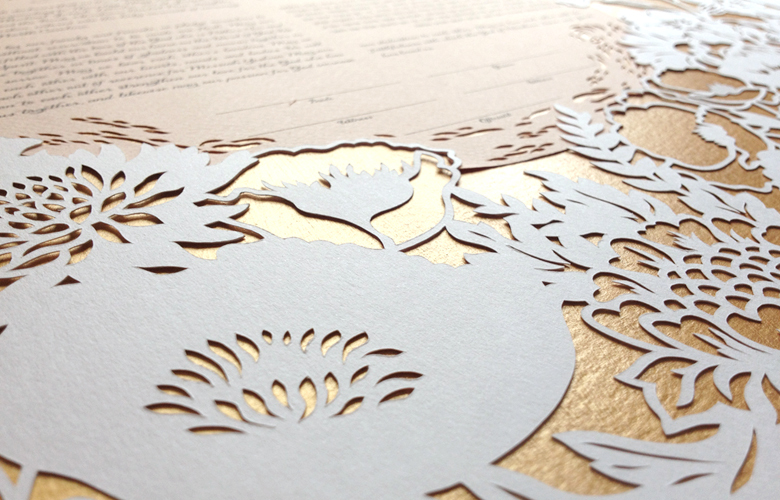 but we added in so much you would need to look over the papercut several times before seeing it all! 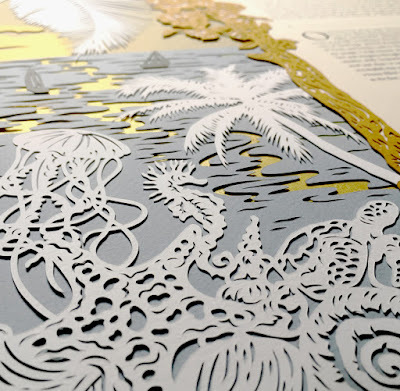 Looking back on the many commissions I did across the years, I spotted a trend in my papercuts. 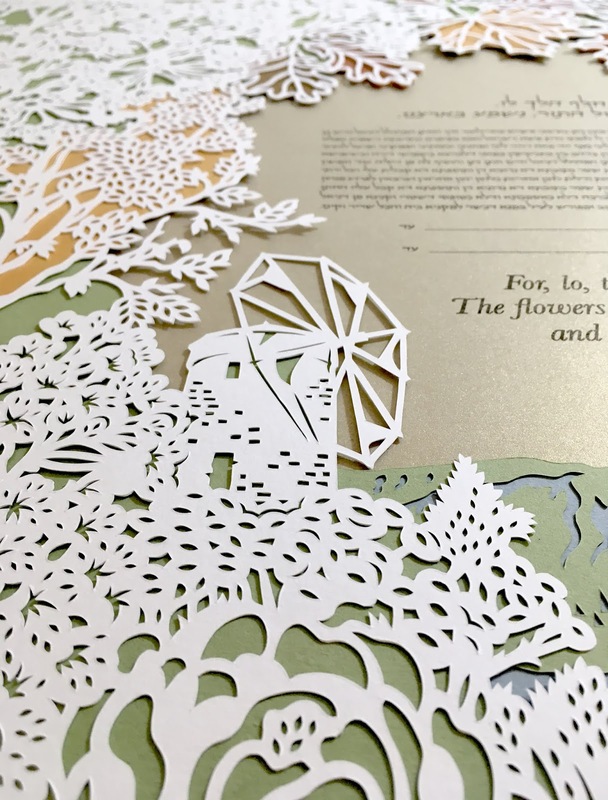 My papercuts were always lush in design but subtle in coloring but last year I noticed my papercuts had more details, more layers, more color - an evolution seen most clearly in this papercut for a wedding that took place earlier this year. Alexi & Benjie actually contacted me after seeing another beach design I did for their friends, so they wanted something in that same grand scale with multiple layers only they wanted theirs in a lighter color palette. Somehow, from the client's wish for a sunset snapshot of Santa Barbara by the beach (emphasis on the ocean) and all the elements that make up their love story in the city, came out this 11 (that's ELEVEN!) layers colorful artwork. I surprised myself with this one! This commission couldn't have come at a better time, it was freezing where I lived and I needed to warm up. Santa Barbara looked like a Mediterranean beach town, and a papercut of it deserved all the light-catching colors in my stock. Alexi & Benjie met fell in love in Santa Barbara. It is their home and a backdrop to their love story so I was worried about capturing it and and all the details that make it special to them, but after a few late night sessions with reality tv playing in the background inspiration struck and I think I did well. I was lucky that Santa Barbara has Mediterranean architecture so I had a lot of familiar angles to pull from - including that of the sandy beach. The cobalt blue dome of the local Hillel center was a starting point, actually. I decided to frame the wedding text with driftwood after they shared with me that for their first date they went to the beach and sat on a log for seven hours talking (can you imagine that connection)! 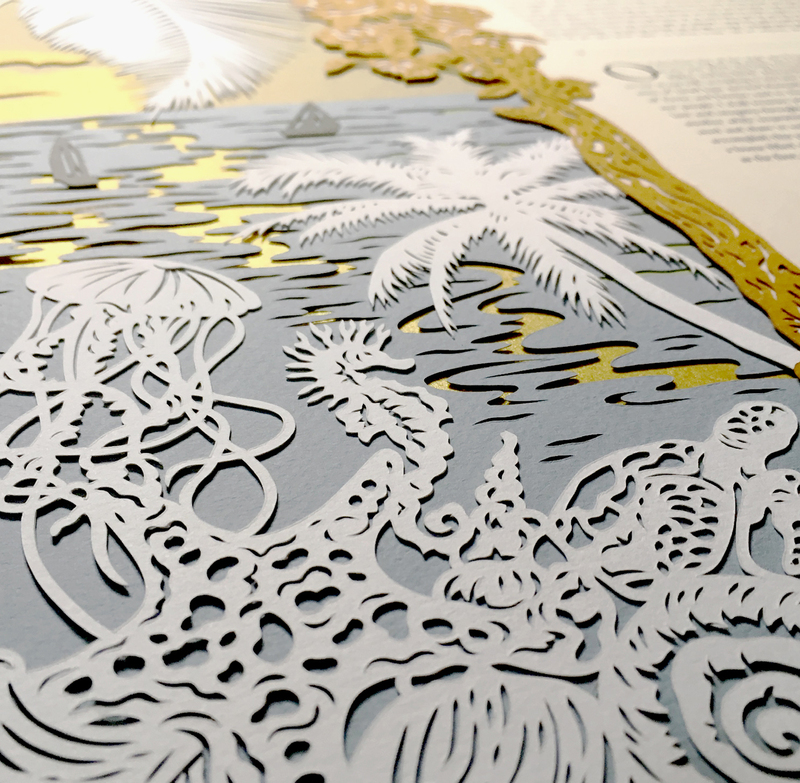 To balance out the cityscape on the right I filled the left portion of the papercut with sea life - from shells to sunset sailing - with the local fruit and flora bridging the gap top and bottom. Terracotta rooftops, bicycles, palm trees, and roses (Benjie likes to buy Alexi rose sculptures so they always have fresh flowers at the house) completed the design. 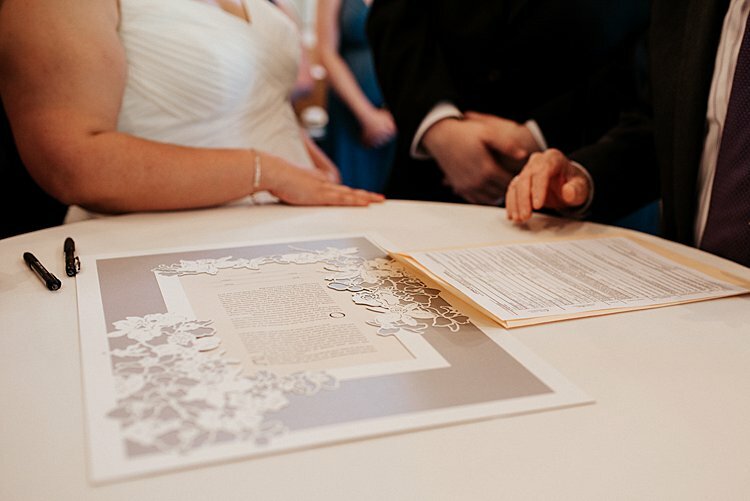 I especially like the addition of the couple's silhouettes gazing at their vows. 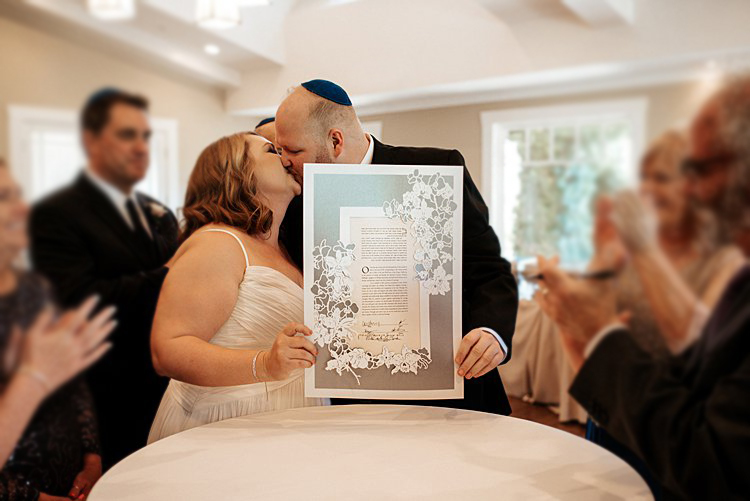 Holly & Will wanted their papercut ketubah to encompass their relationship across the years. It's a beautiful concept and oh my gosh we had a lot of pretty imagery to pull from! Holly gave me a list that included: lace, Chicago Musical Theater, castles, pumpkins, the Scottish Highland games, Superman, the ship necklace Will gave her, 'Safe in the Waves' motto, and more. A lot, right? Sounds random but she included a backstory and reason for every element to explain the emotional connection. The challenge for me was to pick and choose what to include and to create a cohesive composition that worked together not only aesthetically but also story-wise. The two biggest elements I needed to feature were the bridge in Cedarburg, Wisconsin where the couple got engaged (Bill actually proposed to Holly there!) and a cutie-patootie otter couple (they mate for life!) 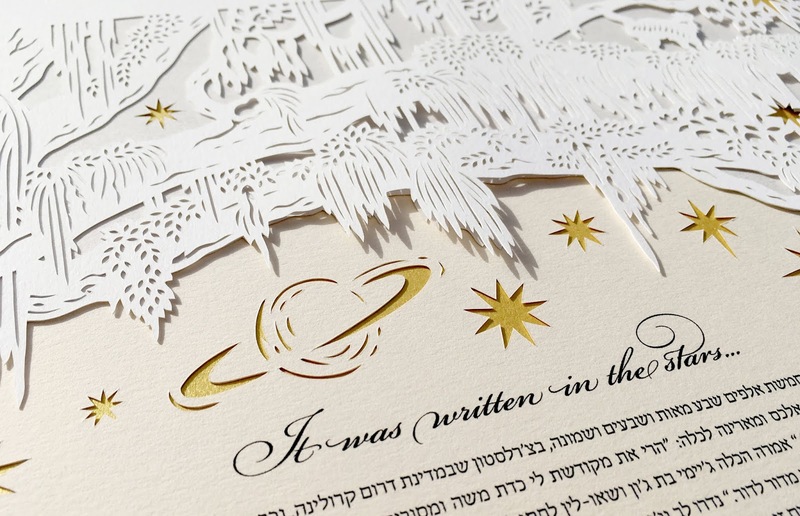 - besides the ketubah text, of course;) Through their symbols - personal and universal - their love story needed to be told with a beginning, middle, and future. That the artwork came out so adorable is just a great bonus!